Steven (Chicagoland, United States) on 29 October 2010 in Cityscape & Urban and Portfolio. My intent was to capture the setting sun's warm colors reflecting off of the buildings, which was posted yesterday. Keeping my camera on the tripod, here was the second photo captured as the sun's warmth disappeared and the night lights were brought up. 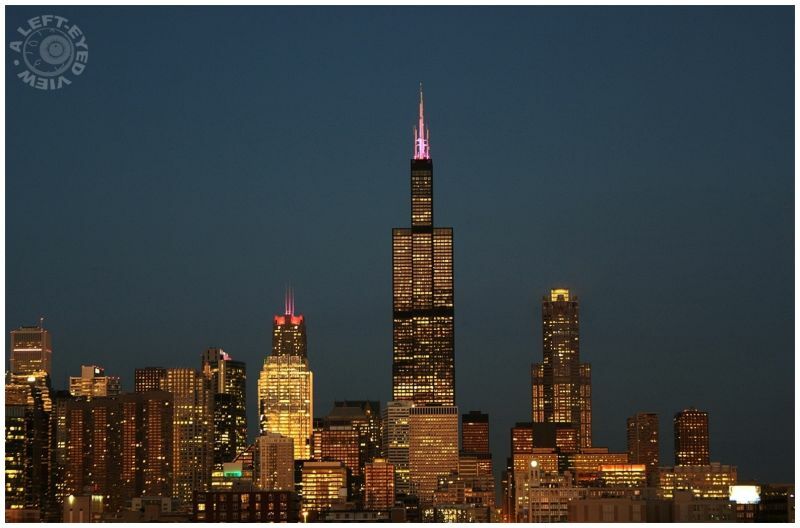 Note the antennae and other architectural elements that are lighted in pink - done in honor of breast cancer awareness month. This is great - with no clouds visible, the focus is entirely on the buildings and their lights! I like this one too.. lovely city lights. Lovely sun lights reflecting in the glasses. Go West. Yes. It reminds of a song... from the Doors. Amazing city and city lights. I loved yesterday's and I think I love this one even just a tad more....both views are great - a unique perspective as you discussed yesterday. And this is a perfect time of day, Steven, just light enough and just dark enough...your work is outstanding! Two great shots, but I have to admit that I like this one a little better, I guess the darker sky makes it for me. excellent city scape as always . I do not know to say anything else of cityscape but only great ;) Sorry ! So beautiful. This is one of the best photos I've seen of this lovely town. I grew up in Illinois and use to sing in Chicago - It's a beautiful city - but I never remember it looking so beautiful as this! great shot! Very nice photo. The framing is very good. Good day Steven. Stunning cityscape! beautiful colors and lights! Another wonderful shot and perfectly framed! excellent exposure and sharpness! the building look really good in the dusk light here - well captured! This strikes me as the perfect balance of light for such a view - a superb result. Another very nice photo of the skyscrapers, nice composition with very good balance between light and darkness! Great capture of that light, good job!